The economy of Philadelphia was heavily based on maritime trade and industrial production. The main port of Pennsylvania from its founding, the city became the most important port in the mainland British North American colonies. A significant commercial center then, Philadelphia was also home to a large amount of industrial production for the time period compared to other early American cities. An outlet point for timber suitable for shipbuilding, and a source of supplies for many of the British Caribbean colonies, it developed a significant shipyard and grew into a center of colonial manufacturing. The wealth of raw materials that the Pennsylvania colony possessed was what quickly led to Philadelphia becoming an important colonial city, and this as the city grew combined with its large population to allow the city to be able to support such a significant manufacturing industry. In fact, outside of domestic servants, this was where the primary amount of slaves that were present in Philadelphia worked. Sail making, rope making, shipbuilding, shoe making, smithing, and various other industries in the city employed black slave labor in addition to the free labor used, and the iron foundries in the colony that supplied Philadelphian manufacturers with raw iron also created demand for the import of slaves as a supplementary source of labor that wouldn’t quit in order to start their own homesteads. 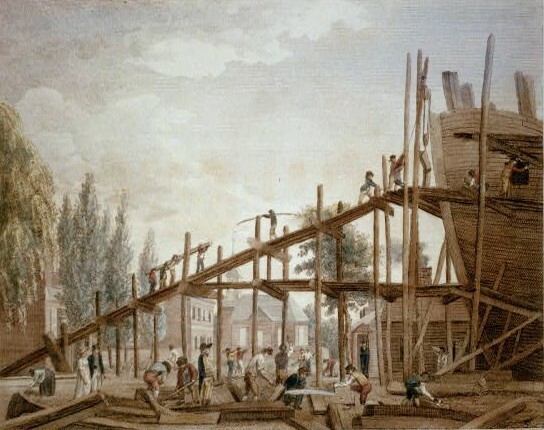 However, reflecting its maritime connections, Philadelphia was much more involved in the slave trade when it came to building and commercially sponsoring the vessels that would bring slave laborers to various parts of the British Empire. Its export of goods including food and lumber to the Caribbean and the imports it received from there was the most significant part of Philadelphia’s overseas trade, further welding it to the Atlantic world and involvement with overseas plantation economics. As a colonial commercial and manufacturing center, Philadelphia did a brisk trade not only with the Mother Country and the Caribbean, but also with the other thirteen colonies. Through its port then, Philadelphia helped move goods between regions throughout the Atlantic world and created a demand to supply its own markets with things such as English fashions, Caribbean rum, and Indigo from South Carolina. The wealth all this activity generated made Philadelphia one of the centers of the British American world, and a natural hub for the discussions concerning American independence once disputes arose between the colonies and Britain. One of the hubs of all this discussion within the city was the coffee house, which as a place for merchants to meet, discuss shipping and commercial news, and negotiate deals, had become a vibrant part of the city’s commercial life. The advertisements posted in such establishments furthered their role as mercantile information centers. It is no wonder then that with all the discontent over taxes and trade controls imposed by Parliament before the American Revolution, much discussion on these issues that would foment rebellion in the colonies occurred in these coffee houses. Philadelphia’s economy then, not only turned it into a commercial hub of the Atlantic World, it created and supported a vibrant urban center that became an important participant in the lead up to American Independence and one of the early capitals of the young American nation before the construction of Washington. Philadelphia would remain the economic capital of the nation until the completion of the Eire Canal helped New York City supplant it in the 19th century.